Math teachers using online material at least two to three times each week in 2015 vs. use at least once a week in 2017. (The 2015 survey didn't include the option of stating "once a week or more," thus, the awkward comparison.) Source: "Changes in What Teachers Know and Do in the Common Core Era," RAND Corp.
Standards for math practice, such as making sense of problems, constructing viable arguments and critiquing the reasoning of others. ELA teachers using online material at least two to three times each week in 2015 vs. use at least once a week in 2017. (The 2015 survey didn't include the option of stating "once a week or more," thus, the awkward comparison.) Source: "Changes in What Teachers Know and Do in the Common Core Era," RAND Corp. The report offered four key findings. Overall, teachers didn't appear to be using many published textbooks aligned with newer standards, even though the Common Core "has raised the bar for what students should know and do." However, the use of online materials that were standards-aligned and content-focused "appeared to rise." 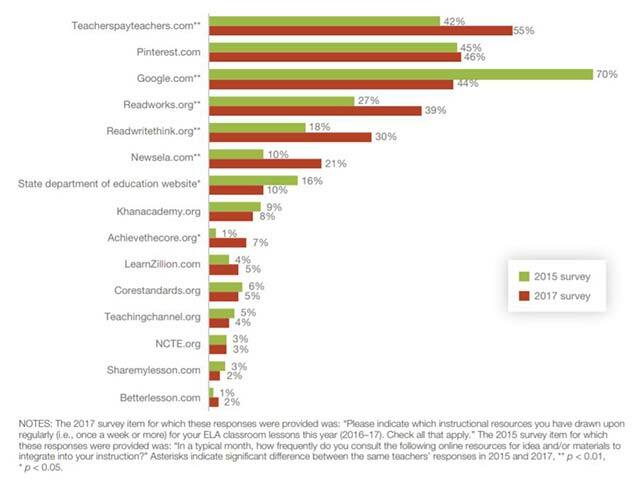 Specifically, TeachersPayTeachers.com and Pinterest.com topped the source list for online materials. 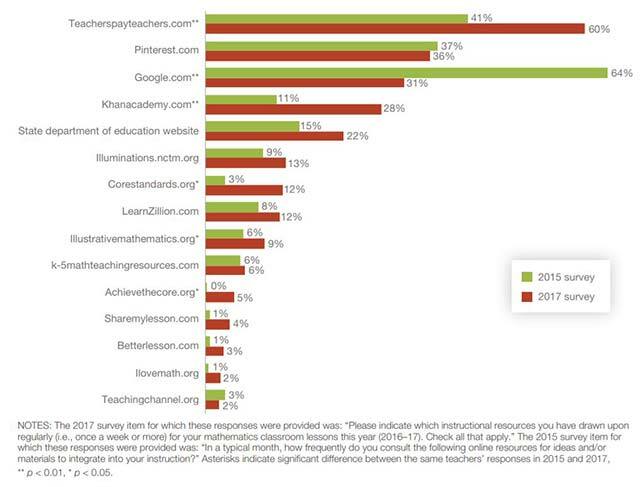 More than half of all math and ELA teachers reported using Teacherspayteachers.com and between a third and a half of math and ELA teachers said they used Pinterest.com. ELA teachers were less inclined to believe the use of complex, grade-level texts was aligned with their standards in 2017 than in 2016, even though their understanding of their state standards hadn't changed. As with the ELA teachers, math teachers' overall understanding of the standards didn't change. However, the project did detect a bit of difference among teachers working with "more vulnerable students" and those teaching "low-vulnerability" students"; the second group reported that their students engaged less in some standards-aligned student practices in 2017 than in 2016, though why that might be was unclear to the researchers. One possibility, the report suggested, was that as teachers' awareness of those practices grows, they engage in them "to a lesser extent over time." Similarly, ELA teachers overall reported that their students engaged less in several standards-aligned practices in 2017 than in 2016. Continue to support teachers' standards-aligned mathematics instruction. Last, RAND pushed for more research to continue monitoring how teachers' instruction "is changing over time" and in response to the Common Core standards. "High-quality implementation of such ambitious standards as the Common Core will likely take many years and require the support of countless stakeholders, including states, districts, schools, teachers, developers of curriculum materials, researchers, and multiple other external partners," the report concluded. "By working together, and by collecting and analyzing data over time, these stakeholders can shape the system that supports high-quality standards implementation." The full report is openly available on the RAND website.